You don’t need a car to escape from the business, the traffic, the congestion, the fog in wintertime and the afa, the humid heat, in summer, of the city to get to a wonderful world of lakes, mountains, castles and good food: just take the train and, sometimes, the boat as recommended in this itinerary to Lake Como and the Villa Carlotta. 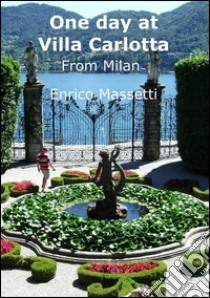 Villa Carlotta is a wonderful example of gardens with exotic plants in the exciting environment of the Como Lake. This trip is especially recommended in spring or autumn, when often you can leave the fog and cold of Milan to reach sun-shining lakefront views in the mild climate of the Lake Como. This itinerary starts from the eastern side of Lake Como, crosses with the ferry to Cadenabbia, to visit Villa Carlotta, with its beautiful gardens.